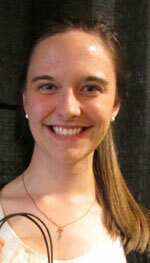 Deanna Beckner has been awarded the Faith in Action Award by the Office of Religious Life at Manchester University. The award is given annually to a student who has contributed in significant ways to the Religious Life and Campus Ministry programs at Manchester, and who has put his or her faith into action on the campus and in the larger community. Beckner is a senior communication studies major from Columbia City, Ind., and she comes from a long line of Manchester alumni — five generations. It started with her great-great-grandfather, who attended what was then Mount Morris College in the 1880s. “Generations of Montels and Beckners have been loyal supporters of Manchester and also significantly involved in their church communities. Deanna has been no exception,” said Campus Pastor Walt Wiltschek, who presented the award Sunday, April 19, at the MU Student Development Leadership Banquet. Beckner has been a Campus Ministry assistant in the Religious Life office since her first year at Manchester. She has also been a key contributor to the Campus Interfaith Board, most recently serving this year as co-facilitator. She is president of Simply Brethren and a long-time participant in the Radically Obedient Brethren Outreach Team; and she has been involved with Praise Jam and other Religious Life programs. Wiltschek said Beckner has worked tirelessly with Students Today, Alumni Tomorrow (STAT); and she also found time to create and give leadership to the new Disney Club on campus. She has been a regular on the MU Dean’s List while balancing all of her activities. Beckner plans to continue giving of her time after she graduates from Manchester by joining Brethren Volunteer Service in the fall. “They, and the placement site where she ends up, will be getting a dedicated, indefatigable worker with a big heart, a ton of gifts, and a rock-solid and growing faith,” Wiltschek said. The award was given at the annual Student Development Leadership Banquet.